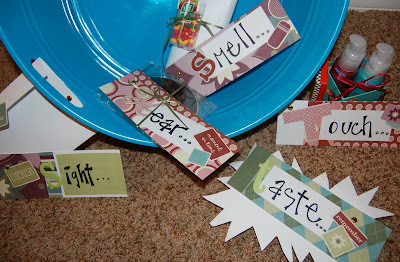 Find a gift for each of the 5 senses. Fill a basket, gift bag, etc. Attach a card that says something like this, "I love you with all my senses..."
Touch: massage oils or lotion, a coupon for a back or foot massage. This picture came from That's So Cuegly. She did a whole post on each sense/gift...way cute! She provides great inspiration---check it out. Thanks for the congratulatory comment. I really appreciate it. My husband and I are so excited. I love this idea, by the way. I will definitely have to do fun little things like this in the upcoming weeks to show my love while my sister-in-law will be staying with us. love this idea, thank you!! we did the crossword puzzle during pillow talk the other night. it was so fun remembering all of our wedding and honeymoon what nots! thank you for all of your fabulous ideas!! !